Michael Anderson is an Australian trained and qualified orthopaedic surgeon specialising totally in hip and knee replacement surgery and arthroscopic knee surgery. 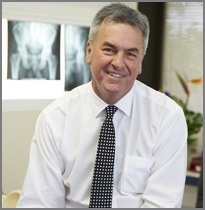 He has been an actively practicing consultant in elective and trauma orthopaedic surgery in Western Australia since 1986. Feature: NO GAP provider with all health funds and this also applies to the specialist anaesthetists that he uses.